One place that is befitting for a king of even a sultan can be found inside one of the luxury Moroccan hotels called the Amanjena resort that is outside Marrakech, Turkey. This has become a popular place for celebrities like David Beckham who celebrated his 40th birthday. It was at this opulent hotel that David and his beautiful wife, Victoria in 2004 had renewed their vows. Amanjena Resort is perfectly tucked within an oasis of olive and palms trees. There is this Moorish heritage that is reflected beautifully throughout the resort’s pisé-walled environment that proudly shows the luxury pavilions right from the old basin. Amanjena means in English ‘ Peaceful Paradise’. This is what is seen around this tourist haven. No one ever makes use of the facilities here and still wants to neglect it. It is secluded and specially designed to make you feel home. For those who are not aware, Morocco has become a destination close to the heart of celebrities. The High Atlas Mountains is the backdrop of the resort and this is Africa’s first Aman resort and it is developed with emerald clay roofs,vines and lawns. 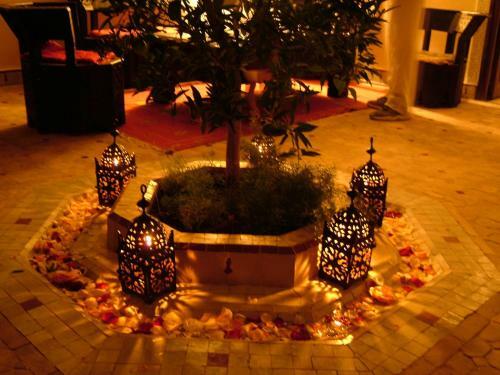 There is the Moroccan marble fountains that would blow you off your feet and then the zellij. Zellif is a hand-cut, glazed tiles in the country. Treatments that guests are offered include manicures, massages, facials and pedicures and there is a timber floor gym that would keep you fit and trim. You can either choose from the Moroccan or the Mediterranean cuisine. Think of having dishes that are served while you are at the pool or even your lunch or breakfast been served as you overlook the golf course. There is even a private dining destination for those who just want to be left alone. The Moroccan-style Pavilions come with a private pool and garden. Now, there is the 18 air-conditioned pavilions that have spacious bathroom, bedroom living room and then a dressing area where you can have the treat of royalty. The living area is where you would find the open fireplace, domed ceiling and a king-size platform bed. You can enjoy the 32 private air-conditioned pavilions in the resort that boasts of terraces with gazebos, wood-burning fires, lantern-lit seating areas, and there is the seven pavilions that have private pools. It does not end here, there is the tranquility that is felt in this hotel, hammam, swimming pool and spa treatment and the ever exciting city of Marrakech. You know that this city is not complete without its souks, historic buildings and gardens. The five star magnificent Amanhena Resort has become a haven to thousands around the world. You want a home that is far away from a home, and then you should be coming here to explore the beauty of Morocco in this resort. The experience is not something that you can easily trade for anything. Life is indeed beautiful and it is here in Morocco that you are going to discover this beauty in a tourist haven that is so spacious. Morocco- My Best Trip In My Life!! !